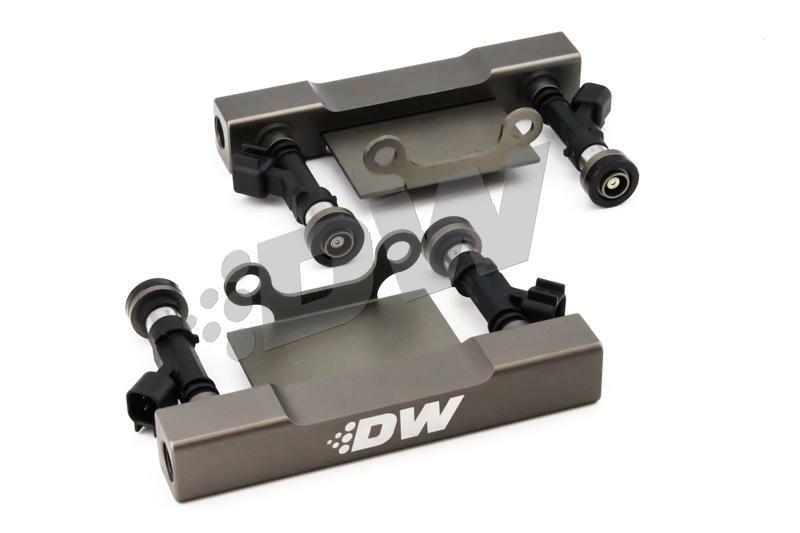 DeatschWerks offers two innovative rail-injector kits for the Subaru WRX, STI and other EJ20 and EJ25 Subaru engines – an Upgrade Kit and a Conversion Kit. Both kits include injectors ranging from 750cc to 2200cc and are engineered as a system where the injector, rails, and mounting hardware all work together to integrate flawlessly into the existing OE manifold and mounting points. Both systems are fully anodized for e85 compatibility, feature large bore -6AN fittings, and include everything needed for a drop in fitment. The DeatschWerks Conversion Kit is for applications that utilize side feed injectors, and in addition to supplying a consistent fuel supply, it allows the customer to run top feed injectors that are less expensive, tune better and are available in many more flow rate options. Our Upgrade Kit is for applications already utilizing top feed injectors. It eliminates the poorly designed OE rails that allow cylinder-to- cylinder pressure variances and includes injectors and rails engineered to work together and provide consistent fuel supply over a wide range of flow rates and pressures.